To build a holistic ministry rooted in love that fosters positive change in the community and beyond in order to transform lives by teaching, preaching, and evangelizing the gospel of Jesus Christ, which will encourage and empower future generations to act upon their faith and honor God through their service. We are followers of Jesus Christ, and we are devoted to worshipping and serving God with our whole hearts. We seek to reach the weary, lost, and unsaved in order to grow and bring the body of believers into a closer and intimate relationship with the Lord. We further commit to creating opportunities to actively effect change through outreach and within our community, which will transform potential into a possibility and, through our love, experience a change that the world may come to see Christ in us. Home of Life Missionary Baptist Church was founded by Pastor Johnny Henderson under the guidance of the Holy Spirit on January 24, 1982 at 1421 W. 69th Street in Chicago, IL. There were 45 people in attendance that included one deacon, Robert Henderson who was later called into ministry and served as the Pastor of New Third Heaven M.B. Church until God called him home, and one visiting Minister, Reverend Zimmerman. Singing “Amazing Grace”, Pastor Henderson preached his first sermon, “So Close But Yet So Far” from Acts 26:28. On February 2, 1982 Home of Life M.B. Church was incorporated under the laws of the state of Illinois, and the motions were finalized on February 28, 1992. This was only the beginning. As our membership slowly outgrew our current residence, God saw fit to relocate us to the heart of the Westside where our ministry would be beneficial. On December 19, 1982, we marched into our new church home at 4647 W. Washington Boulevard. The Home of Life Community Development Corporation was later established to better service the needs of our members and the surrounding communities. It was incorporated on October 28, 1993, offering programs for child care services, food pantry, job training and placement, senior care, and affordable housing. The vision expanded beyond Washington Street to continue our ministry, and a sacred edifice arose from the rubble of vacant land of what today is known as our new home. We moved into our new building that includes a beautiful sanctuary, upgraded child care center and banquet facility located at 4650 W. Madison Street on November 2, 2002. Our story continues, and we are excited about what God will enable us to do next. CEO of Home of Life Community Development Corporation. As Pastor of Home of Life Missionary Baptist Church, which under the direction of the Holy Spirit he organized on January 24, 1982 at 1425 West 69th Street. 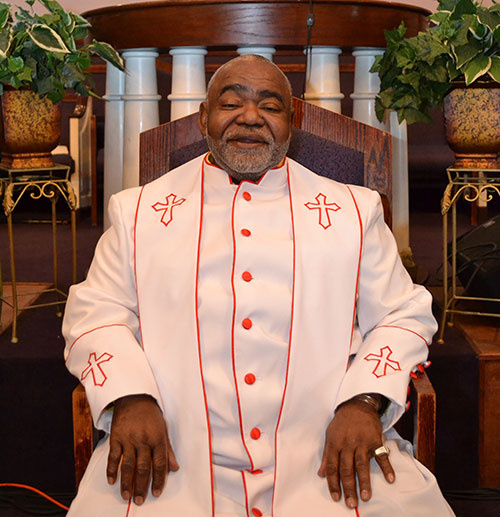 Reverend Henderson is responsible for implementing, monitoring and administering to the Church and Community with a focus on the Word and Work of God. The membership of Home of Life has grown significantly since 1982 from less than hundred to over 1000 people. On November 2, 2002 Pastor Henderson led his congregation along with many other pastors/ministers, family and friends into their beautiful new church edifice and childcare facility at 4650 West Madison Street. Through his work as Chief Executive Officer of Home of Life Community Development Corporation, which was organized and incorporated on May 19, 1993 as a 501(c)(3) organization in the State of Illinois. Reverend Henderson seeks to aid the development of the holistic person by providing supportive services designed to enhance the physical, mental, spiritual, nutritional, social and educational well-being of families. The services provided will improve the quality of life in the community and promote healthier and happier individuals. These services include childcare for Toddlers (2yr. olds); two programs for children 3-5 (State Pre-K and Head Start); School Age (6-120 and Youth Services (6-18); The Reverend Johnny Henderson Scholarship Fund, Job Training and placement; New Beginnings, Affordable Housing and Senior Citizen Program. Reverend Henderson serves as Treasurer/Board Member of the Westside Baptist Ministers Conference (WBMC) which consists of over 200 ministers who meet weekly on the study of spiritual, community and political issues. He was appointed by the President of WBMC to assist him in directing the concerns of the Ministers Conference during the reign of the late Mayor Harold Washington. He continues to serve in that position working with whomever is appointed to the current administration. He also serves as Treasurer of the Crusade Tent Revival, which began in 1984. This week of service is held each year under a tent and seeks to reach out and offer God’s Plan of Salvation to anyone that will listen. Reverend Henderson has been featured in the Chicago Sun-Times, Chicago Defender, Austin Weekly and Austin Voice Newspapers as founder of Home of Life Community Development Corporation and for his tireless work to serve the holistic person. He has received numerous citations and awards in recognition of his leadership role and outstanding efforts working with the youth, community and numerous minister organizations. Pastor Henderson was recognized by “The South Side Community Organization” as ‘Man of the Year’ and is listed in the 2004-2005 Edition of National Register’s Who’s Who in Executives and Professionals. The 2005 issue of Chicago Sun-Times. Reverend Henderson attended Olive Harvey College where he majored in English with Math as a Minor, Chicago Religious Institute where he studied Baptist Ecclesiastical and Moody Bible Institute where he completed and extensive and intensive study of the Bible. Reverend Henderson is pacesetter for change and is committed to Community. He is consistently looking for creative ways to partner with others to bring the best resources and opportunities to those that need them. There are no limits that he hasn’t reached to positively impact someone’s future. Be sure to keep your eye on Reverend Johnny Henderson of Chicago, IL to see just what he will do next.